Not to be confused with African bullfrog. The American bullfrog (Rana catesbeiana or Lithobates catesbeianus) is a semi-aquatic frog. It belongs to the family Ranidae, or 'true frogs'. Bullfrogs are native to most of North America, Canada and Mexico. The ones that live in northern America hibernate during winter. However, bullfrogs in southern US states are active all the time. Bullfrogs have been seen in South America, Asia, Western Europe and the Caribbean. These bullfrogs were brought on ships. Many people, including pet owners, have placed bullfrogs outside of their native area. They have done this: on purpose because they no longer want them, to control the pest population, or by accident by catching them in fishing nets. Bullfrogs can adapt and live almost anywhere if there is water nearby. They can eat rodents, insects, small fish, arachnids, small birds, crustaceas, small mammals, worms, and other frogs. Because of this, they have been blamed for many animal extinctions. Bullfrogs live in large bodies of water such as swamps, lakes, and ponds. They like to stay near the edge of the water. During a rainstorm, they may travel on land. They travel in search of a new habitat. Bullfrogs are prey to various birds like herons, and their life in the wild is much less than in captivity. One captive bullfrog lived almost 16 years. The name "bullfrog" was given because males roar when mating with a female. Bullfrogs can be kept as pets. Captive bullfrogs are given rodents, small fish, crickets, worms, and fruit flies as food and treats. Pet owners may add supplements on the frogs food for health. Bullfrogs can host many viruses, bacteria and parasites. They were blamed for an intraerythrocytic virus outbreak in Canada in 1997. Bullfrogs are the cause of the chytrid fungus spreading into Arizona. The fungus is one of the main reasons that there are fewer amphibians. A female bullfrog can lay up to 20,000 eggs. Bullfrog tadpoles take up to a year to become a young frog. Males will stay behind and take care of the tadpoles. Males are territorial and will attack any animal, including their own kind, if they come near them. Bullfrogs can decrease the mosquito population. They do this by eating most of the mosquito's larvae. Bullfrogs do not move during the day, except if there is food nearby or when threatened. Bullfrog legs are eaten by humans. The International Union for the Conservation of Nature (IUCN) rates the bullfrog as "Least Concern", which means that they are not an endangered species. However, they are dying because of habitat loss, water pollution, pesticides, and over harvesting. The American bullfrog (Rana catesbeiana) is its common name. It is one of 90 species of the genus Rana. The bullfrog is known as Rana toro in Spanish countries. In Quebec, Canada and Louisiana US the bullfrog is called ouaouaron (wa'wa'ron); a word originating in the Wendat language and borrowed in the 17th century. The American bullfrog is also known as Lithobates catesbeianus. The parent family for Rana is Ranidae, or "true frogs". Lithobates is a combination of two Greek words: "λίθος" and "βαίνω". The word "λίθος", as a feminine noun, means gemstone or smooth stone. While "βαίνω" is a Greek verb which means "walk". Ranidae is split into nine sub families. Ceratobatrachinae (southeast Asia), Conrauinae (Africa), Dicroglossinae, Micrixalinae (India), Nyctibatrachinae (India), Petropedetinae (Africa), Ptychadeninae (Africa), Raninae (Australia, South America), and Ranixalinae (India). The American bullfrog's genus name comes from the Latin word rana, which means frog. Catesbeiana came from Mark Catesby, an English naturalist, who first discovered the bullfrog. Bullfrogs were first described in 1802 by George Shaw. Shaw described the bullfrog in his book General Zoology or Systematic Natural History. A bullfrogs call is a slow deep g-r-r-u-u-u-u-m. Young bullfrogs will make a high pitch chirp before going in the water. They do this when they feel threatened. Bullfrogs have toxic skin, though it is not harmful to humans. The toxins make it less likely that other animals will eat them. 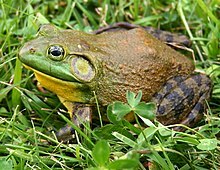 The American bullfrog is the largest of the "true frogs" family. Bullfrogs can reach a length of 6 to 8 inches (15 to 20 cm). Females are larger than males. Bullfrogs can weigh up to 1.7 pounds (770 g). Bullfrogs are either brown or green. They also have darker spots on their back. Bullfrogs have webbed feet for swimming. They can leap up to 6 feet (1.8 m). Male bullfrogs can be heard roaring when mating with a female. Males also have bigger tympanic membranes which cover their ears. Bullfrogs have brown or gold eyes. They also have broad flat heads and bodies. The mouth of a bullfrog are small and have tiny teeth inside. Bullfrogs can live up to 4–5 years. There was one captive bullfrog that had lived up to 18years. Males are territorial and will attack any animal, including their own kind, if they come near them. They will jump, wrestle, and even chase any animal away. Bullfrogs are good at hearing. A group of bullfrogs are called an "army". Many bullfrogs are known to have many viruses and bacteria. However, only a few of them are important to nature. Bullfrogs was blamed for an intraerythrocytic virus outbreak in Canada in 1997. They were also blamed for a chytrid fungus that spread into Arizona in 2000. The chytrid fungus is believed to be one of the major causes of the decline in amphibian populations. Many bullfrogs can have many parasites including helminths, trematodes, nematodes, protozoans and leeches. In a 1913 study, it was found that bullfrogs will eat any animal it can overpower and stuff down its throat. Bullfrog stomachs have been found to have rodents, baby muskrats, small turtles, snakes, frogs (including bullfrogs), birds, and a bat, as well as the many invertebrates, such as insects. These studies show the bullfrog's diet is unique among North American Rana. Bullfrogs are also known to eat ducklings and tadpoles. Bullfrogs have teeth on the top of their mouths. Their tongues are capable of flipping their food into their mouths. Bullfrogs will eat at night. In captivity, pet bullfrogs are given crickets, worms, small fish, rodents, and fruit flies. In the wild they like to eat crayfish, water beetles, snails, and dragon fly larvae. Bullfrogs will eat each other, this makes up of 80% of their diet. In a 1935 study, it was found that smaller bullfrogs eat mostly insects. However, larger bullfrogs eat crayfish, frogs and mice. In an Arizona study in 1988, it was found that bullfrogs there eat invertebrates such as snails and insects. While two other studies, one in 1977 (in New Mexico) and the other in 1993 (in New York), found that bullfrogs in New York eat mostly Ranidae frogs. The study from New Mexico, found that bullfrogs there eat mostly toads. Adults can help decrease the mosquito population by eating most of their larvae. Bullfrog tadpoles can reach 6 inches in length. Bullfrogs will become sexually active after 2–4 years of becoming a frog. Females are attracted to males who have territories that provide the most food. Bullfrogs will mate between early spring to early summer. A male bullfrog grabs the female and begins roaring. A female bullfrog will make an aggressive call. The female lays her eggs in shallow waters. The male releases sperm on the eggs as fertilizer. A female can lay up to 20,000 eggs. The eggs of the bullfrogs are laid on the surface of water. They are then exposed to harmful UV-B radiation. Because of this, many bullfrogs may have abnormal (not normal) development. The eggs hatches after four days. They are called "tadpoles" and live in the water eating algae. Bullfrog tadpoles are larger in length than other tadpoles by other frogs. They become frogs in more than a year. In captivity, they can become frogs in twelve weeks. If a bullfrog tadpole remains as a tadpole for more than a year, it will become larger when it is an adult. Because of this, they will have a better chance at survival in the wild. There are many predators such as larger fish, crustaceans, and some birds that eat some of the eggs and tadpoles. Because bullfrog tadpoles are not very active, they are less likely to be eaten by any animal. However, if spotted, bullfrog tadpoles will be eaten by salamanders and invertebrates. When they become adult frogs, the predators become food for the bullfrogs. Males will stay with their tadpoles and protect them. Males will even take their tadpoles, by digging through mud, to other large bodies of water. They do this if the water is drying up. The tadpoles of a bullfrog are not a favorite food source for fish. This is because of their awful taste. This gives bullfrog tadpoles a better chance in surviving than tadpoles of other frogs. Bullfrog tadpoles spend most of their time not swimming. This makes them less noticeable. Tadpoles of a bullfrog have also raised concerns. Their favorite food is algae and while growing up, they consume large amounts of it. They can also live anywhere where a human house is, if there is water nearby. Froglets will begin hopping out of the water and onto land. Once the tadpoles become "froglets", they begin hopping out of the water and into land. They loose their tails once they are at this stage. The froglets will stop using their gills and use them as lungs. They begin eating small insects. The froglets will remain near the water where they were laid. If there is a drought, they will search for a new habitat. At the time, froglets become easy prey to larger frogs, reptiles, raccoons, foxes, and birds. Froglets become adult bullfrogs after four months they began hopping on land. During the day time, bullfrogs may swim around. Some bullfrogs will stay near plants. Bullfrogs in southern US states are active all the time. Bullfrogs in northern US states hibernate during the winter time. Mating season begins in spring and ends in early summer. In northern US states, bullfrogs will begin coming out of hibernation. They will begin eating and swimming. During the summer, bullfrogs will spend most of their time in the water. They will feed on mosquito larvae. During the fall, northern US states bullfrogs will begin hibernating. Southern US states bullfrogs will become semi-aquatic. During the winter time, they will continue to be semi-aquatic. If the weather outside is cold, they will hibernate for a few days. Bullfrogs are active at night. They can be seen hopping around gardens and streets. During the day, they will be near the edge of the water. During the daytime, they become motionless (not moving). They will begin moving if food is nearby, or if they feel threatened. The International Union for the Conservation of Nature (IUCN) rates the bullfrog as "Least Concern". This is because they are found almost in every continent. "Least Concern" means that the bullfrog is not an endangered species. There are more bullfrogs in southern United States than there is in the north. However, bullfrogs populations are decreasing because of habitat loss, water pollution, pesticide and over harvesting. 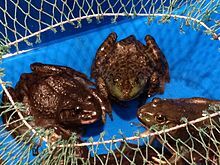 In 2012, Mark W. Stone chairman of the Santa Cruz County Board of Supervisors, is currently trying to ban the import, sale, and the keeping of bullfrogs in Santa Cruz, California. If the board signs the bill, Santa Cruz will be the first county in the United States to ban bullfrogs. Stone is trying ban bullfrogs because of the bullfrogs appetite. They have been blamed for making many animals become an endangered species in that state. Bullfrogs are an invasive species in Puerto Rico. Bullfrogs were accidentally introduced starting in the 1900s in Colorado and California. Fishermen went out fishing and took their catchings back home, some had bullfrogs in their nets still alive. They have been introduced by pet owners who no longer wanted them. Some pet owners bought bullfrogs to control pests near their homes. The impact of bullfrogs being introduced has negative outcomes. Because of their diet, they can decrease populations of other frogs. Bullfrogs have been blamed for making the California Red-legged Frog a near-threatened species. They have also been blamed for many other amphibian extinctions in California. Bullfrogs compete with other frogs for food, and can even kill their own kind if food is no where to be found. Bullfrogs are considered one of the worst alien invasive species (AIS). The AIS are animals who are able to decrease other species and even make them extinct worldwide. Bullfrogs are responsible for the decline of garter snakes in Mexico. In a laboratory experiment by Alford in 1989, bullfrogs decreased the population of Cope's gray treefrog. The study introduced the bullfrogs with Cope's gray treefrog in a controlled environment. Bullfrogs are a source of food for Southern United States and the Midwestern United States. People hunt bullfrogs at night near rivers. The bullfrogs' legs are cooked, while their backs are fried. In China, bullfrogs are sold alive for eating. They are then killed and cooked with vegetables. In the state of California, people must have a license to catch bullfrogs for food. In schools, bullfrogs are dissected in biology classes. Usually, this is done in middle school. The dissecting is a method for teaching students the anatomy of a bullfrog. Bullfrogs are also kept as pets. They are kept in aquariums or a terrarium. A terrarium is a tank that is decorated with plants and soil on one side. On the other side, there is water. A bullfrog would need one place for land and another for water. ↑ 1.0 1.1 1.2 1.3 "Lithobates catesbeianus". International Union for Conservation of Nature and Natural Resources. Retrieved 18 June 2012. ↑ Pauly, Gregory (2009). "Taxonomic Freedom and the Role of Official Lists of Species Names". Herpetologica 65 (2): 128. ↑ 4.0 4.1 Wechsler 2002, p. 5. ↑ Crowley, Joe. "American Bullfrog (Lithobates catesbeianus)". Ontario Nature. Ontario Nature Inc. Retrieved May 27, 2012. ↑ "Lithobates catesbeianus". United States Department of Agriculture. 4 April 2012. Retrieved May 24, 2012. ↑ 7.0 7.1 Harding 1997, p. 139. ↑ 8.0 8.1 8.2 8.3 "American Bullfrog". Shastaherps.org. Retrieved 11 July 2012. ↑ "Where did it come from?!". BioWeb.com. Natural blues. Retrieved 27 May 2012. ↑ "Rana catesbeiana Shaw". wcsu.edu. Retrieved 11 July 2012. ↑ Wechsler 2002, p. 7. ↑ 12.0 12.1 12.2 12.3 12.4 12.5 "American Bull Frogs". Essortment. Demand Media. Retrieved 27 May 2012. ↑ 13.0 13.1 Elizabeth, R. (29 November 2010). "Species Spotlight: North American Bullfrog". BrightHub. BrightHub. Retrieved May 27, 2012. ↑ 14.0 14.1 14.2 14.3 "American Bullfrog Facts". Washington NatureMapping. Retrieved 11 July 2012. ↑ 15.0 15.1 15.2 "American Bullfrog". National Geographic. National Geographic Society. Retrieved 24 May 2012. ↑ 16.0 16.1 Dickerson 2009, p. 235. ↑ 17.00 17.01 17.02 17.03 17.04 17.05 17.06 17.07 17.08 17.09 17.10 17.11 17.12 "Animal Profile: North American Bullfrog". Seaworld.org. Retrieved 16 July 2012. ↑ 18.0 18.1 18.2 Lannoo 2005, p. 544. ↑ 19.0 19.1 19.2 Hughes, Catherine D. "American Bullfrog Facts and Pictures". National Geographic Kids. National Geographic Society. Retrieved 16 July 2012. ↑ Murphy 1984, p. 14. ↑ 21.0 21.1 21.2 21.3 21.4 21.5 Lannoo 2005, p. 545. ↑ 23.0 23.1 Starosta 2006, p. 122. ↑ 24.0 24.1 24.2 24.3 Lannoo 2005, p. 543. ↑ Purser 2006, p. 34. ↑ Stebbins 2003, p. 445. ↑ 27.0 27.1 27.2 Harding, Jim. "Bullfrog (Rana catesbeiana)". FCPs.edu. Island Creekes. Retrieved 19 June 2012. ↑ 28.0 28.1 Lannoo 2005, p. 546. ↑ Stebbins 2003, p. 461. ↑ Lannoo 2005, p. 540. ↑ 31.0 31.1 31.2 31.3 31.4 Murphy, Martin (17 February 2003). "Invasive Species Summary: Bullfrogs". Colombia.edu. Retrieved 11 July 2012. ↑ Lawrence 2003, p. 13. ↑ 33.0 33.1 Purser 2006, p. 16. ↑ Lawrence 2003, p. 11. ↑ Purser 2006, p. 18. ↑ Lawrence 2003, p. 14. ↑ Gray 2009, p. 22. ↑ Gray 2009, p. 25. ↑ Gray 2009, p. 28. ↑ Gray 2009, p. 17. ↑ Lannoo 2005, p. 542. ↑ Gray 2009, p. 29. ↑ 43.0 43.1 Platt, John (13 December 2011). "Should California Ban American Bullfrogs?". Scientific American. http://blogs.scientificamerican.com/extinction-countdown/2011/12/13/should-california-ban-american-bullfrogs/. Retrieved 19 June 2012. ↑ "Invasive Species Profiles: Bullfrog". Invasive Species Profile.gov. United States Department of Agriculture. Retrieved 11 July 2012. ↑ 45.0 45.1 Storer 2004, p. 256. ↑ 49.0 49.1 Glotzhaber 2000, p. 85. ↑ Gray 2009, p. 7. ↑ 51.0 51.1 51.2 Haney 2009, p. 20. Wikimedia Commons has media related to Rana catesbeiana. Wikispecies has information on: Rana catesbeiana. This page was last changed on 14 December 2018, at 16:31.